Resinous and potent indica dominant strain. The plants yield very powerful buds, coated with resin. It produces a very strong, long lasting high, more cerebral than knockout. It is a popular medicinal plant. These seeds can produce plants that are fantastic in both appearance, and effect. One of the most typically indica strains, White Russian is a stable cross of AK-47 and White Widow (a prize winning indica clone). Medium height, consistent plants and dense, very resinous flower tops (crystals appear after about 5 weeks of flowering). With such a strong indica background, the plants smell quite strong during both their growth and flowering period. Like many seed banks across the world, Serious Seeds began with one man’s journey and for Serious Seeds, that man is Simon. The founder of Serious Seeds, Simon started life as a non-smoker. However, in 1986 during a trip to Africa, he discovered his love for marijuana. For nearly a decade, Simon was cultivating genetics for personal use, experimenting with his favourite strains in order to satisfy his own tastes. However, as more people began trying his product, he found himself changing professions from High School teacher to full time breeder with Sensi Seeds. After a year of working in a popular seed bank with Sensi, Simon decided to start his own company and in 1995, Serious Seeds was born. Immediate success ensued, with a Cannabis Cup win in Serious Seeds’ first year as an active seed bank. That was followed up a year later with another Cannabis Cup win for his White Russian strain. An amazing start for such a new breeder. Simon has always been keen to keep Serious Seeds a relatively small seed bank. However, their size has never diminished the quality of their seeds or their reputation as one of the most coveted seed banks in the world. You can enjoy Simon’s legendary strains for yourself; buy Serious Seeds from Seedsman now. 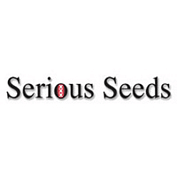 To find out more, read our 10 Quick Questions with Serious Seeds.